Hi Friends: It's time for the Fall Coffee Lovers Bloghop and the DT for super-sponsor JessicaLynnOriginal stamps is joining in the fun. My 2nd card for the hop uses the Fall 2017 Coffee Lovers Blog Hop Digital Rubber Stamp 3 from JessicaLynnOriginal stamps. We would love to see what you do with this set, if you want to post them up on Jessica's Facebook page and join us in the Fall Coffee Lovers Bloghop. Visit all of my design teammates and see what else they've done for the bloghop. Thanks for stopping by today! I hope you have time to do what makes you happy! Print image onto smooth white cardstock and color with Spectrum Noir markers - cut to fit card base and color edge with dark purple marker. Cut patterned paper to fit A2 card base, ink edges, and machine stitch along the edges, then adhere to card base. Cut strip of black glitter paper and glue to card front. Place black thread behind the focal image, then use foam squares to adhere to card base. Add purple dot stickers to card as shown. Super cute! I love your paper choices! 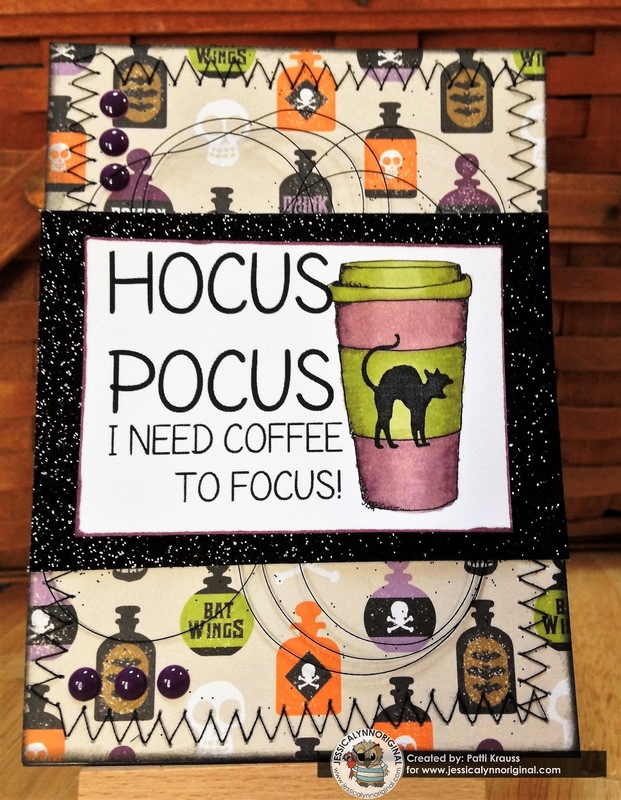 Fabulous Halloween-themed coffee card! That background paper is cute and I love the thread and stitching details! How FUN! I love that coordinating paper! Fun and fabulous! I love the Halloween theme and colors. Awesome background paper to this wonderful image! This is an awesome card! Love the cute BG paper paired with this awesome sentiment. Love this Patti! Great papers and love the colors! Glitter, stitches... all my favorites! Beautiful papers, such a fun creation!